It is suitable for stitching of jute bags, cloth bags, paper bags, polypropeleno bags etc. Capacity : 500 -600 Bags per Hour. It has twin needle, four thread, parallel double chain stitch sewing head with speed 25000 stitches per minute, stitching width 5 to 9 mm adjustable. 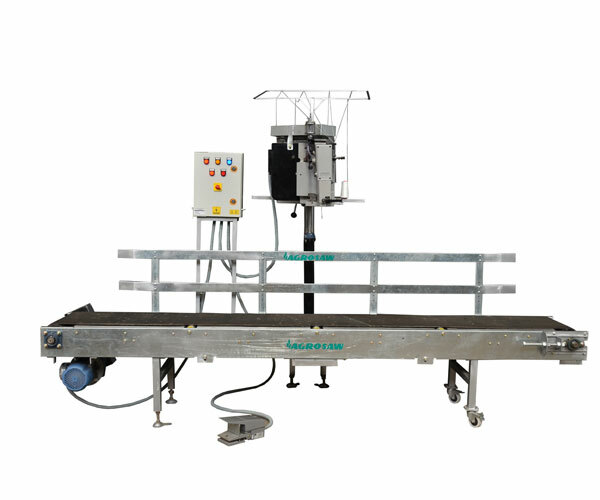 The head is fitted on telescopic shaft and belt conveyor of 3 meter length. Electric motor of 1 HP, 3 phase for sewing head and 1 HP 3 phase for conveyor. Complete with foot operated paddle switch. Sewing head height varies from 250 mm to 1000 mm depending on bag size.